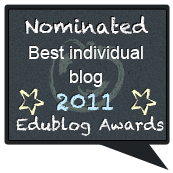 One of the best places to find great new resources are the edublog awards. 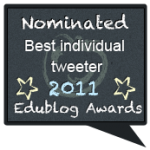 I love taking the time to look at all of the Tweeters, bloggers, resources, and hashtags listed. Thank you to those of you who nominated for me. 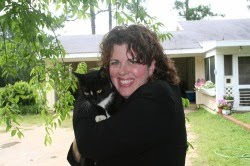 I'm totally grateful and humbled you'd take the time to include me on your list. 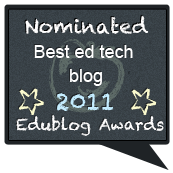 Right now, I've got personal nominations in five categories: best individual blog, best individual tweeter, best edtech resource sharing blog, best teacher blog, and lifetime achievement award. Wow! I have to admit to you one thing. 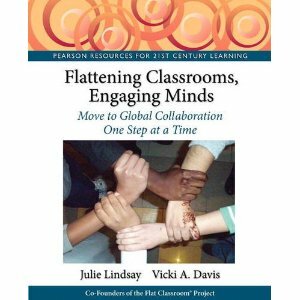 My goal with this blog is to be the best teacher blog I can be. 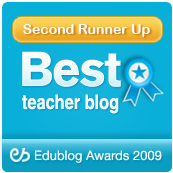 The one year I won the award (back in 2008) really meant a lot to me. 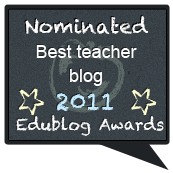 I know you have many people to vote for and if you have to pick one category for me, I'd ask for the "Best Teacher Blog" because that is what I want to be. 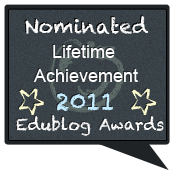 I personally don't really know that 6 years of blogging could count me worthy of a lifetime achievement award but I do appreciate being nominated. It really means a lot. 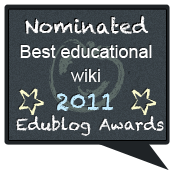 Flat Classroom was nominated in best educational wiki and of course, I really hope it receives some votes because we now have almost 2,000 kids on three projects collaborating there as of this moment.